A sophisticated page-turner about a wealthy New York family embroiled in a financial scandal with cataclysmic consequences. Now that he's married to Merrill Darling, daughter of billionaire financier Carter Darling, attorney Paul Ross has grown accustomed to New York society and all of its luxuries: a Park Avenue apartment, weekends in the Hamptons, bespoke suits. When Paul loses his job, Carter offers him the chance to head the legal team at his hedge fund. Thrilled with his good fortune in the midst of the worst financial downturn since the Great Depression, Paul accepts the position.But Paul's luck is about to shift: a tragic event catapults the Darling family into the media spotlight, a regulatory investigation, and a red-hot scandal with enormous implications for everyone involved. Suddenly, Paul must decide where his loyalties lie-will he save himself while betraying his wife and in-laws or protect the family business at all costs?Cristina Alger's glittering debut novel interweaves the narratives of the Darling family, two eager SEC attorneys, and a team of journalists all racing to uncover-or cover up-the truth. 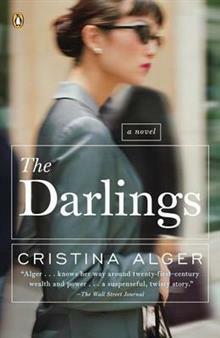 With echoes of a fictional Too Big to Fail and the novels of Dominick Dunne, The Darlings offers an irresistible glimpse into the highest echelons of New York society-a world seldom seen by outsiders-and a fast-paced thriller of epic proportions.